If you do not want to use Trend Micro Antivirus and Security, you can simply uninstall it. 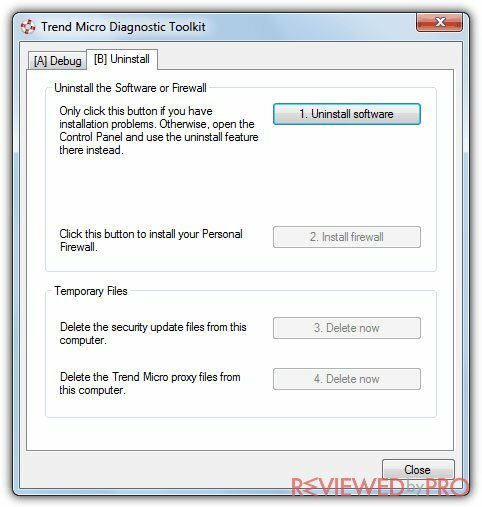 This article will provide you with 10 simple steps how to uninstall Trend Micro Security using the Diagnostic Toolkit. Firstly, you should download the Diagnostic Toolkit from the official website. Then, right-click in SupportTool.zip and choose Extract here. Once the extraction is complete, SupportTool.bat will appear in the selected location. Right-click on the SupportTool.bat file and select Run as administrator. Click Yes on the User Account Control window. Locate the (C) Uninstall tab. Select Uninstall Software under the Uninstall tab. Confirm the uninstallation by clicking Yes. Check the checkbox I copied my serial number and select Uninstall. Finally, click Yes and restart the PC. Make sure to close the program and navigate your mouse to the bottom-left side of the screen and click the Windows logo. Then, open your System Settings by clicking the Gear icon on the menu. Look for the App option and click on it. Then, you will be redirected to another pop-up window. You will see a list which contains all the software present on your system. You can scroll down the list and search for Trend Micro by yourself or use the search bar type Trend Micro. The latter makes the process quicker. Click the Trend Micro logo and the line will expand. Two options will be given to you: Modify and Uninstall. In this case, you need to press Uninstall if you want to eliminate the program. Now you should notice this question on your screen: Are you sure you want to remove Trend Micro?, Click on the Yes option if you agree to remove the program. Now the application will present to you two check boxes. You have to select whether you want to delete all the files of the application. Then, press Remove. The software will warn you that you still possess the active subscription. Once again, click Remove. Finally, you will see a note that the anti-malware app was removed from your system. Here there are two options for you: either to restart the computer now or after a while. It is better to restart the computer immediately. Congratulations! Now Trend Micro Antivirus and Security has been successfully deleted from your operating system. However, do not forget to protect your computer by upgrading to a newer Trend Micro Antivirus and Security version or by choosing another security software. If you are not sure which Internet security software or antivirus application to choose for your PC, make sure to check out our security section and choose an application that fits your needs! Our security team at Reviewed by Pro constantly tries new products in order to provide you with up-to-date information and reviews of the latest Internet security and antivirus applications not just for your Windows PC, but also for your Mac and Android devices.